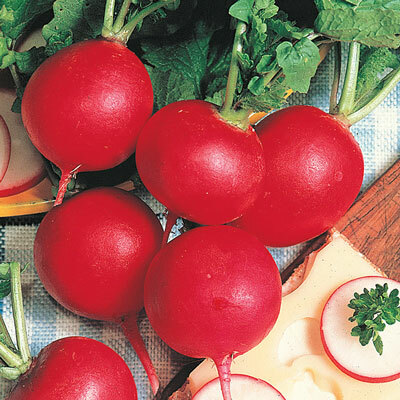 German Giant Parat Radish | Henry Field's Seed & Nursery Co.
Never gets too hot or fibrous. Ready at marble size, but sweet and mild at any size. 29 DAYS. Botanical Name: Raphanus sativus; Family - Brassicaceae. Spread: 2 - 4 inches. Days To Maturity: 29 days. Soil Requirements: Rich, well-drained fertile soil. Seed Count: Approximately 250 seeds per packet., 1/2 ounce is approximately 1,000 seeds; 2 ounces is approximately 4,000 seeds. The seed tape is 15 feet long and has approximately 205 seeds. Fruit: Up to baseball size fruit.